Creative License: Put their ideas to work. Or better yet, put them to work on their own ideas! One of our sons turned his bedroom door into a collage display of sports pics, bumper stickers, and magazine cut-outs. (Thought his father was the only artist in the fam!) Rather than see the handwriting on the walls (literally), try chalkboard paint or large size, write on, “cling” decals for a place to put notes, quotes, and doodles around the room instead of traditional wall hangings. Reuse, Recycle, Repurpose: Rather than hanging that bathroom wall cabinet in the bathroom, use it as a bedroom display area for sports awards, collectibles, baseball caps, lanyards, and such. How about replacing the closet door with window sheers rescued from Aunt Mary’s thrift store donation pile? For the younger set, a discarded play wagon and a coat of paint could equal “the book wagon” for books they love to read before bed. Jungle Jam: Have a roarin' good time when you add some storage trunks, world maps, and maybe even elephant wall decor to make a jungle-themed room. The safari starts here! Nautical and Nice: Pirates may rule the high seas, but a more nautical theme could help your matey's bedroom sail through the teen years, too. Navy and sailor white, plus recycled items from the boat yard like flags, safety rings, life preservers, recycled rope, and of course, boats of all kinds! Home on the Range: What boy wouldn’t like a cowboy room? 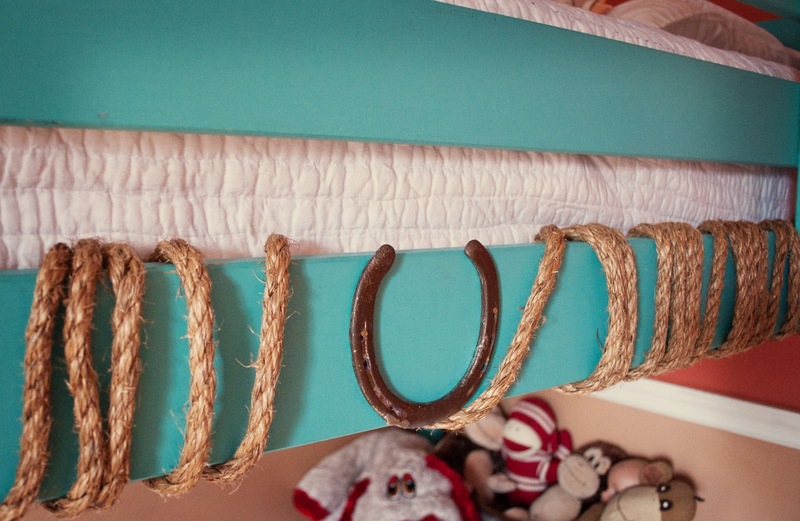 One creative blogger made “cowboy beds” for her boys simply by adding rope and discarded horseshoes to the sides of the bunk beds. Spruce up the rest of the room with rustic metal stars, party-type cowboy hats, recycled bandannas, etc. These low budget, high impact ideas are only just a start. Let us know what you come up with! We'd love to hear from you!